NBC's September 7 Commander-in-Chief forum was a test run for the highly anticipated debates between Hillary Clinton and Donald Trump. The consensus was that the hour-long event was an unmitigated disaster. Moderator Matt Lauer was widely panned for his outsized emphasis on Clinton's emails and his failure to fact check Trump's lies. It is imperative that this dynamic not be replicated in the upcoming debates. To that end, we are joining with our community to #DemandFairDebates. There was not much of a contest in [NBC's Commander-in-Chief] forum with Hillary Clinton and Donald Trump. Mrs. Clinton answered the questions of the moderator, Matt Lauer, in coherent sentences, often with specific details. Mr. Trump alternated between rambling statements and grandiose boasts when he wasn’t lying. Mr. Lauer largely neglected to ask penetrating questions, call out falsehoods or insist on answers when it was obvious that Mr. Trump’s responses had drifted off. If the moderators of the coming debates do not figure out a better way to get the candidates to speak accurately about their records and policies — especially Mr. Trump, who seems to feel he can skate by unchallenged with his own version of reality while Mrs. Clinton is grilled and entangled in the fine points of domestic and foreign policy — then they will have done the country a grave disservice. Whether or not one agrees with her positions, Mrs. Clinton, formerly secretary of state and once a member of the Senate Armed Services Committee, showed a firm understanding of the complex issues facing the country. Mr. Trump reveled in his ignorance about global affairs and his belief that leading the world’s most powerful nation is no harder than running his business empire, which has included at least four bankruptcies. To understand the political environment in which the presidential debates are taking place, we have to look at media coverage of the candidates over the course of the campaign. With a few notable exceptions, the 2016 election has been shaped by an intractable double standard against Hillary Clinton. 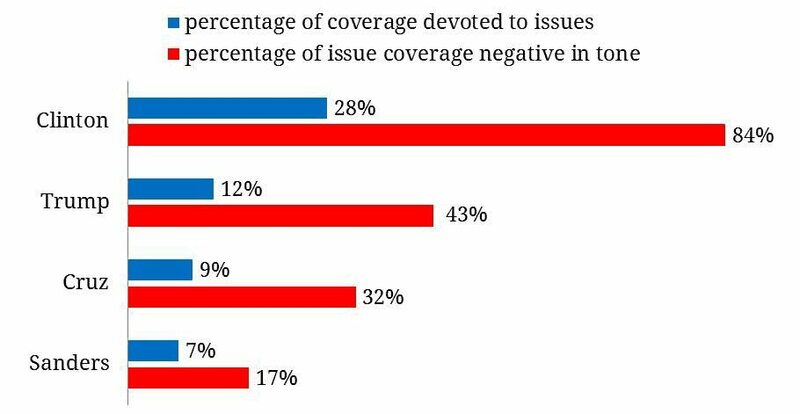 Studies from Harvard University and the Washington Post have concluded that she has received more negative coverage than any other candidate, including her sole remaining opponent, Donald Trump. This, despite the fact that she is by far the most qualified person seeking the presidency this cycle, and perhaps any presidential cycle in U.S. history. There are numerous examples of the corporate media tipping the scales for Trump, both through commission and omission. His first invocation of Clinton's assassination, on August 9, dropped off the front pages after a few days. His second, on September 16, didn't even make the top section of most major publications. Clinton was saddled with the Romney-esque 47% label for speaking the truth (inelegantly) about some of Trump’s supporters, while Trump has been given a free pass for actually adding 3 points to Romney's 47% and calling 50% of Americans "do-nothing" freeloaders. Although corporate media outlets will protest that they have covered Trump's transgressions, what they fail to admit is that they never follow through as they do with Clinton. For her detractors, repetition is the weapon of choice: Her emails have been covered in leading media outlets for 566 out of 570 days since the story broke in March of 2015. In spite of his countless disqualifying comments, Trump has never faced a fraction of the drumbeat on any single issue. Which means that Clinton goes into the debate with a glaring disadvantage: Voters have been primed to have a Pavlovian response to only a single word. Say "emails" and it conjures 18 months of unsubstantiated and false claims about Clinton's character. 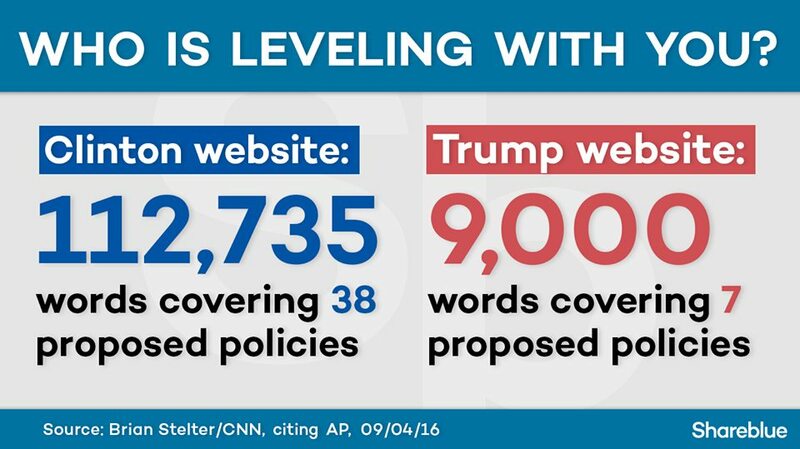 CHALLENGE TO MEDIA: Name ONE @realDonaldTrump story with 45 consecutive days of coverage. #Hillary's emails are at 451. Ten times more. Contrast that relentless and aggressive Clinton email coverage with the free pass given to Trump for an interminable series of disqualifying transgressions. In recent days, he has gotten scant attention for, among other things, invoking his opponent’s assassination for the second time, saying the U.S. military is the “gang that couldn’t shoot straight,” saying Black communities “are in the worst shape they’ve ever, ever, ever been in,” having his foundation exposed as something of a slush fund, questioning the First Amendment, and questioning Second Amendment rights for Black citizens. You would think that the corporate media's blatant favoritism toward Trump would be rewarded by him. You'd be sorely mistaken. I love watching these poor, pathetic people (pundits) on television working so hard and so seriously to try and figure me out. They can't! Actually, he first said reporters are "the lowest form of life," but upgraded them instantly to "the lowest form of humanity"
As a consequence of the grossly lopsided coverage of the 2016 election, Gallup has found that trust in the mass media is at an all time low. Which brings us to the debates. Matt Lauer's moderation of NBC's Commander-in-Chief forum was an important inflection point. In a single hour, he exemplified what many of us have criticized for more than a year: Uneven, obsessive, and frequently hostile coverage of Hillary Clinton paired with absurdly low expectations for Donald Trump. During the September 7 forum, Lauer held Clinton and Trump to entirely different standards, aggressively grilling her on her emails while letting Trump dishonestly claim that he had never supported the Iraq War. He repeatedly interrupted Clinton as she was speaking, while treating Trump with sheepish deference. Lauer's segment with Clinton looked like an antagonistic debate; his segment with Trump looked like a polite conversation. Lauer spent so much time on Clinton's emails — for which she has been officially exonerated of wrongdoing, and for which she has already expressed regret multiple times — that he later had to rush her through her response on ISIS, a real national security crisis. American voters deserve better than this severely imbalanced journalism during the presidential debates. If moderators adopt the same approach as Lauer, lingering on questions about "optics scandals" like Clinton's emails and the Clinton Foundation, or asking her the familiar insipid questions about her likability, she will be afforded less time on more serious issues that actually matter: Foreign policy, national security, climate change, gun reform, healthcare access, reproductive rights, racial justice, LGBTQ rights, immigration reform, disability rights, criminal justice reform, equal pay, family leave, labor rights, education, voting rights, infrastructure, among others. All of these issues, and more, are of concern to Hillary Clinton. In fact, there is such disparity between her renowned mastery of policy details and Trump's evident lack of interest, that any effort to diminish debate time spent on policy critically disfavors her. Those numbers speak volumes. The time spent on "optics" unquestioningly benefits the candidate whose entire campaign is about almost nothing but optics. And that does not serve voters. It does not help them make informed decisions. Which is ultimately not good for the future of the nation. Debate moderators step into their historic roles carrying the weight of the media establishment's ruthless double standard against Hillary Clinton. True fairness requires a clear-eyed understanding and acknowledgment of that injustice against the first woman with a viable shot at the presidency. Already, we're seeing troubling signs. "Wallace has a conflict of interest because of his relationship to former Fox News CEO Roger Ailes. Ailes is reportedly informally advising Donald Trump and helping him prepare for the debates." Compounding the problem, Wallace recently made the false assertion that Trump is now winning the transparency debate on health. Wallace's conflict of interest is of grave concern. As is the corporate media's propensity, so glaringly manifested by Lauer, to hold Clinton and Trump to different standards, in an effort to create parity between the two unevenly matched candidates. Members of the press tasked with moderating these debates should be keenly aware that drawing a false equivalence between a highly qualified woman and a man with little relevant experience is one of the most basic forms of gender bias, and they must endeavor to avoid falling into this dynamic. It is not "objectivity" to create the illusion of parity where none exists. To the absolute contrary, holding mismatched candidates to different standards isn't balancing the scales. Rather, it's tipping the scale in favor of the unqualified contender. With less than 50 days left, there is simply no time for the media to restore equilibrium by giving the same intensity of sustained coverage to Trump’s actual transgressions as they have to Clinton’s perceived ones. The clock is running out. If, in questioning Clinton, moderators simply echo the subjects their colleagues have been repeating for the last year and a half (or longer, in some cases), they will automatically tilt the debate in Trump’s favor. The national media have been marching through the forest of this election for 18 months. Their reporting on Trump has been a haphazard meander from tree to tree. Their coverage of Clinton has been a focused trek, creating a path of well-tread grooves. Now every time a question settles into those grooves, voters know exactly where they’re headed: Down the path that’s been cut to a familiar destination. The destination is a caricature of Clinton as a corrupt, dishonest and disliked monster. Debate moderators have an all-important task ahead of them. They must avoid that path. 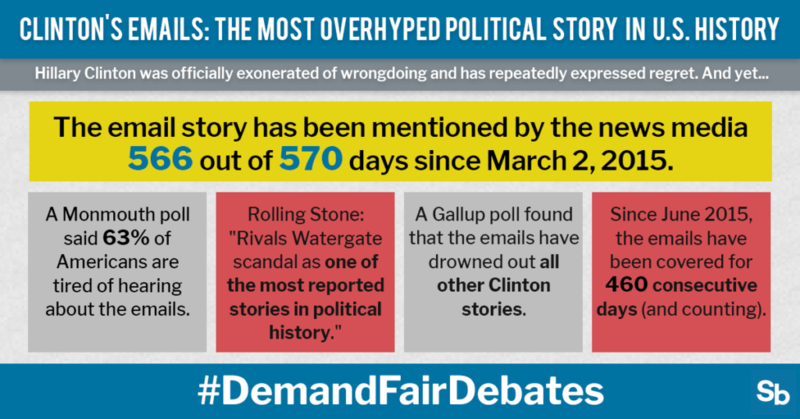 For the benefit of the candidates themselves, for voters, and for the nation, we #DemandFairDebates. And if the scheduled moderators cannot commit to providing them, then they should be replaced with people who can and will.